We got up extra early that last morning in Vegas as we had a long day driving from Vegas to Yosemite. 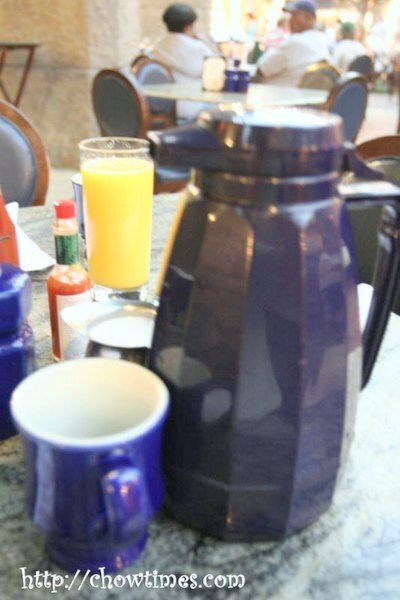 This is one breakfast we know we want to load up on as we have no plans to stop for lunch until we get to Yosemite. Since Rio is known as an All-Suite hotel, I figure that they would be worth checking out. 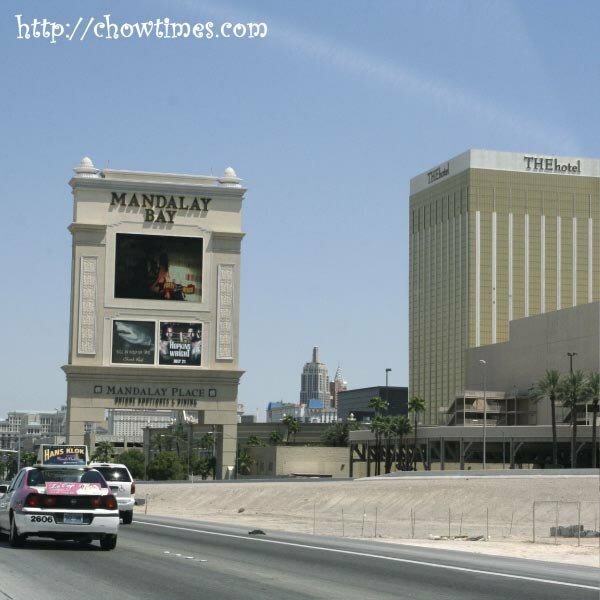 The Rio hotel is not located along the The Strip but a few blocks west of the South Las Vegas Blvd. 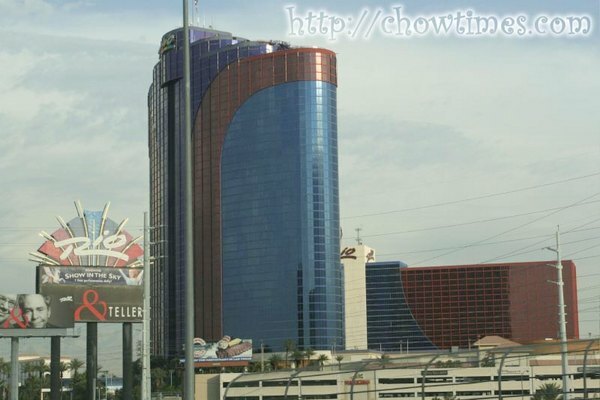 Driving down the Strip, one would not miss noticing the red and blue tower. 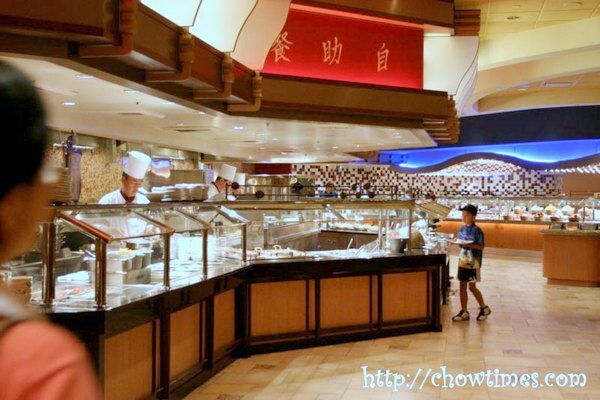 The Carnival World Buffet is known to be the first buffet in Las Vegas to have multiple action stations and the buffet that introduces high-end buffets to Las Vegas. 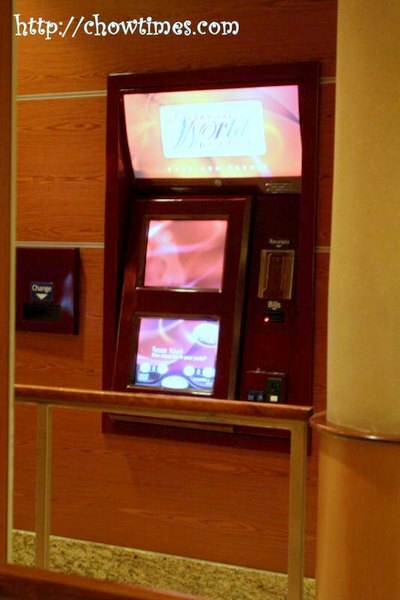 They have several electronic payment machines, much like an ATM to make your payment. I was very impressed and thought why didn’t the other buffets do this. We were there early at slightly past 7AM. There were hardly anyone around when we were there. The buffet tables were the longest we have ever seen. 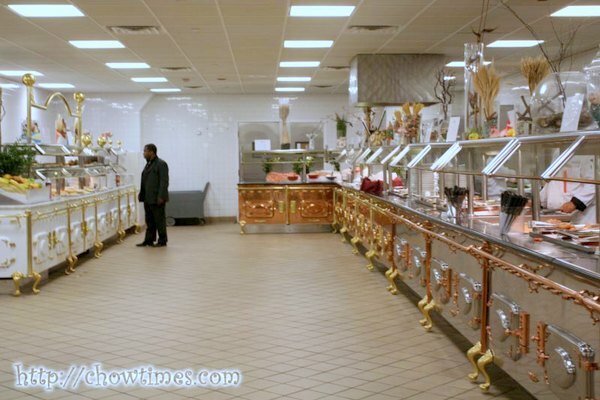 What you see below is just perhaps a quarter of the buffet counters around. They are arranged by themes. The food are more authentic than any we have ever been to. The fresh carved meats was our favorite station. The meat were just fresh out from the ovens. Don’t you just love it seeing steam rising as they carved the meats? I do. I know this is breakfast but I just must have the prime roast. I figured this will be the last time we’re gonna have this until we get to Reno … so why not eat to our fill, right? Updated: 11th Jan 2015; This restaurant is closed according to Urbanspoon.com. Our original plan was to try that go-just-before-they-change-menu stunt at the Flamingo’s Buffet. I had thought that they operate the the same way as the other buffets which they change their lunch spread to dinner spread at about 4’ish every day. It would have been absolutely awesome as we wanted to be able to watch live flamingos in a lush garden while enjoying our buffet. But … their brunch ends at 2:30PM and then re-opens at 4:30PM for dinner. Shoot! They are closed for two hours in between meal times. We did not have a Plan B. 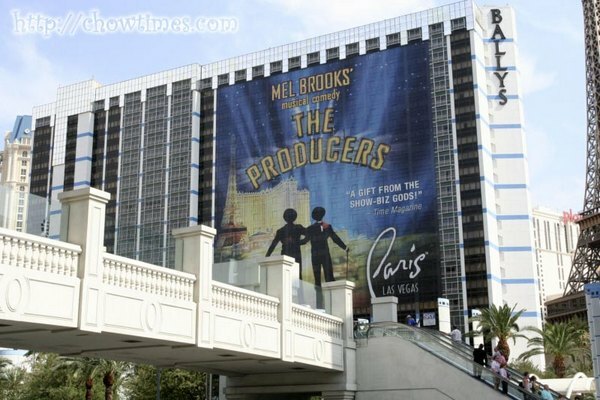 So, the closest nice place we can think of is Bally’s across the street. From the looks outside and the name itself, it seemed like a nice place for a buffet. We had no idea what this looked like. It was pretty hot that day and we did not feel like hotel hopping to scout for a better buffet. Moreover, our intention is still to pull the 4PM menu-change stunt and we are running out of time. Bally’s it was. We’ve been spoilt. 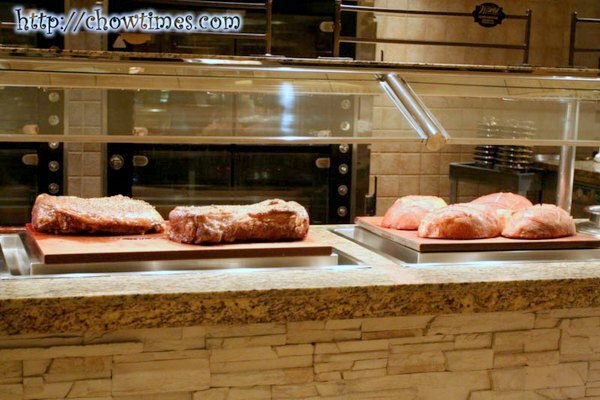 I can’t help but comparing the Bally’s Big Kitchen Buffet to Paris’ and Bellagio’s. For one, they don’t have long queues. When we walked in just before 4PM, there were no one at the cashier’s and only a few tables were taken. The buffet tables had a very simple layout. It’s located in a corner section of the dining room. Price wise, it was $64 for the four of us. 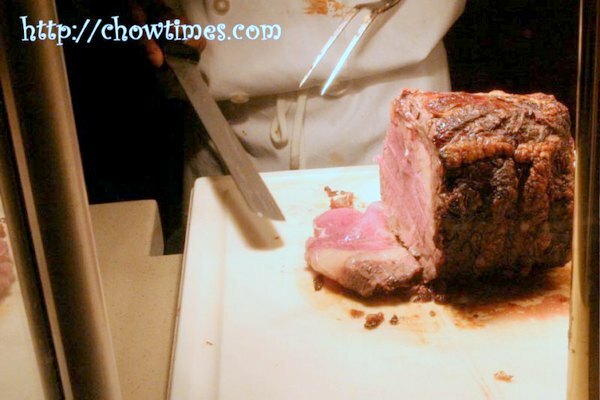 They were pretty generous with the Prime Roast and sliced a thick piece even without us asking for a extra thick one. Needless to say, Arkensen and I had several of this. We finally picked up a rental car for the rest of our vacation. Initially we wanted to drive to the Grand Canyon but decided against it after I learned that it is 300 miles from Vegas to the South Rim. What a bummer … we’ll definitely do that as a separate trip next time. Instead, we went to the Hoover Dam. It is just less than an hour east of Vegas. First comment … I learned that it’s actually cheaper if you pick up the car from the city/hotel than if you pick it up from the airport. So, we picked the car up from the Avis location at The Venetian on the Strip. Secondly … car rentals are way cheaper in the US than in Canada. While the rates looked cheap, what is expensive is the insurance (something called the Collision Damage Waiver) that adds up quite significantly to the rates. I declined getting it because firstly I have a travel credit card that specifically gives me such coverage and also I have Roadstar coverage from ICBC. I think I did the right thing. Car Rental companies make their money primarily from selling the insurances, I believe. I always had to deal with sour faces when I decline their coverage. So, tell me, what do you do regarding CDW when you rent a car? Anyway, the car was great. Getting to the Hoover Dam was easy enough. With now a car, our first stop was at Safeway to load up on snacks and drinking water. 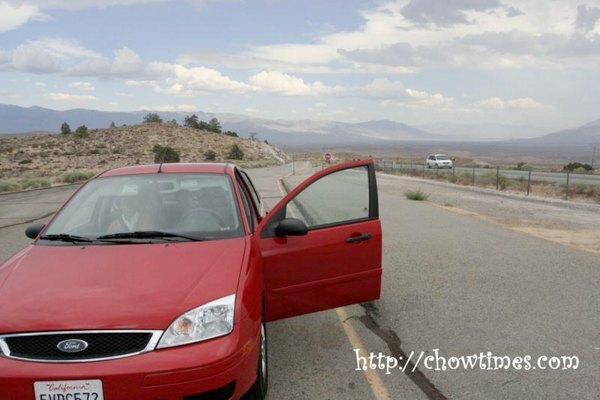 Driving into Hoover Dam area, we had to pass through a security checkpoint. We were surprised at the amount of traffic. We parked at the multi-storey car park (on the Nevada side of the dam). It was expensive, $7. It was only later that I learn there are free open parking areas at the Arizona side. 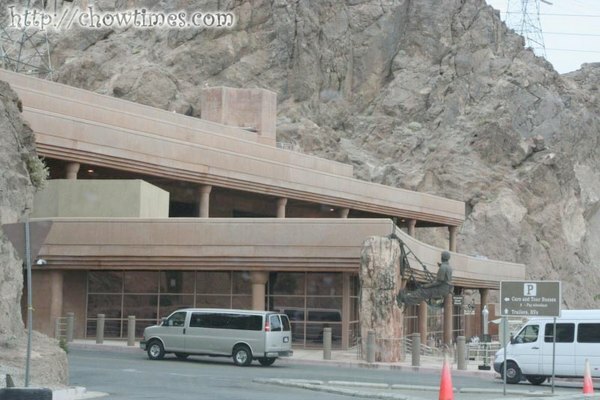 From the car park, it was just a short walk to the main reception area of the Hoover Dam. 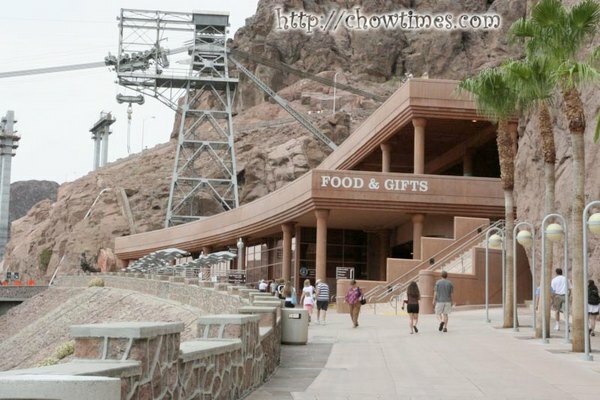 The Hoover Dam is a very popular tourist destination with thousands of visitors every day. We decided to go to Paris for another buffet in the morning. 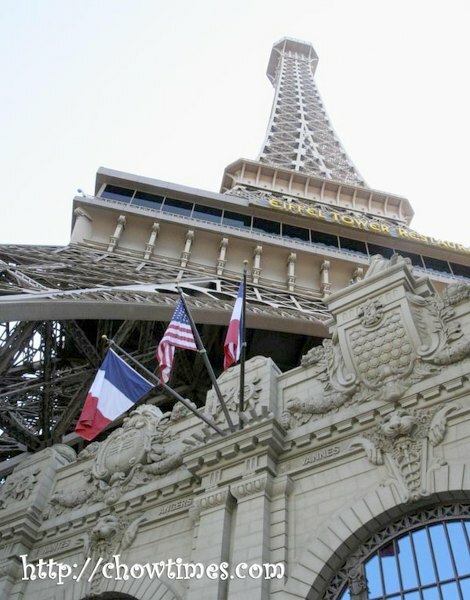 To me, Paris is one of the classiest hotels on The Strip. Its very well planned and especially for one who had been to Paris recently, I could related to many of the designs in this hotel, in particular the Eiffel Tower, the Arc du Triomphe, the Fountain and Louvre. The interior is designed like you’re walking down a cobbled Paris street in an evening. I love that feeling especially in the front entrance and the casino area where it does not feel overwhelmingly casino-ey. 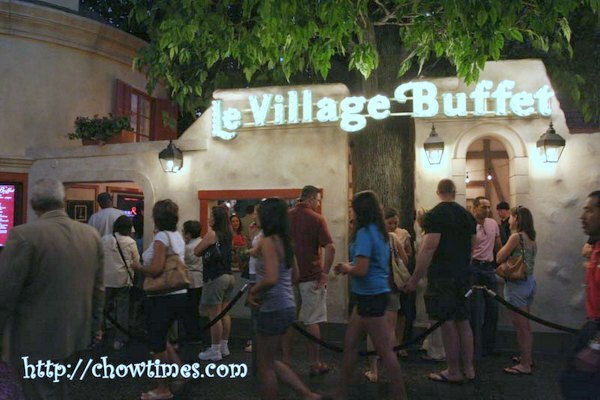 The Le Village Buffet came highly recommended from a lot of friends as being the best buffet. It is one of the expensive ones, like Bellagio. MammaViv told us that once they went to Le Village at 10:30AM and ended up having both breakfast and lunch at the same time. This is because Le Village changes their breakfast spread to lunch at 11:00AM. 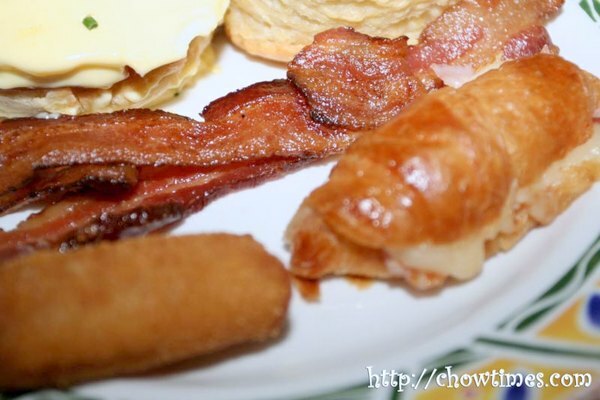 So, we decided to give that tactic a try to land a larger choices of buffet items for a lower breakfast price. I thought I had timed it well. Well, I thought if I had gotten to Le Village by 10:15AM, I would have been OK to be able to get in by 10:30AM. 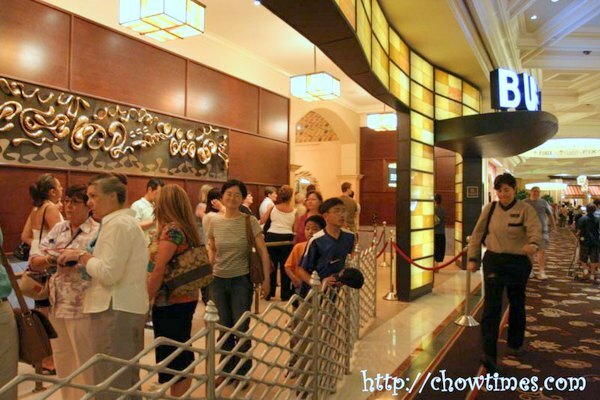 To my surprise, the buffet line was already long at that time when we got there! 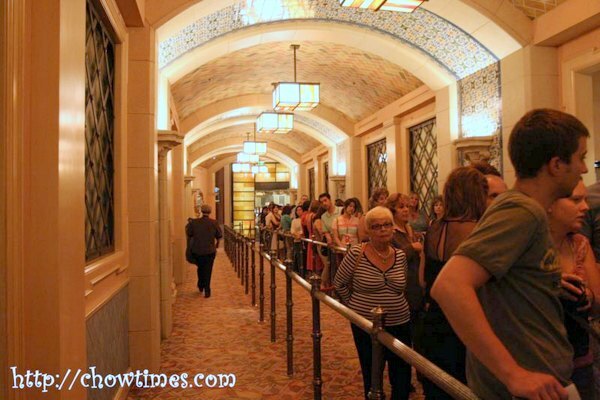 Comparing this line with Bellagio’s, I estimated that it will take 30 minutes or even longer to get in. Fortunately, the line went faster than I anticipated and left us time to sample their breakfast spread. The bill was $64 for the 4 of us. It’s more expensive for lunch but don’t have the numbers. 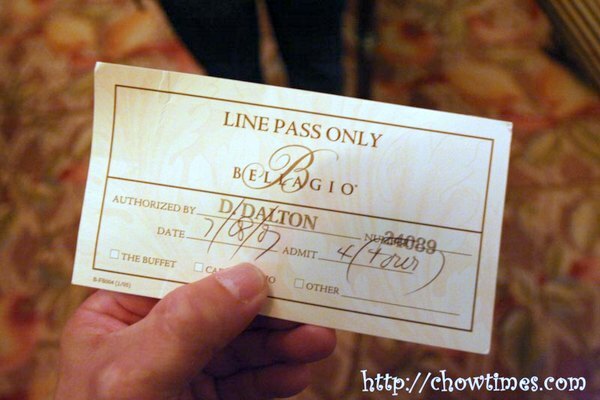 I think it’s really cheap after what we had spent for Bellagio’s dinner buffet. Everyone would love how Le Village is setup. It is designed like a French village square. 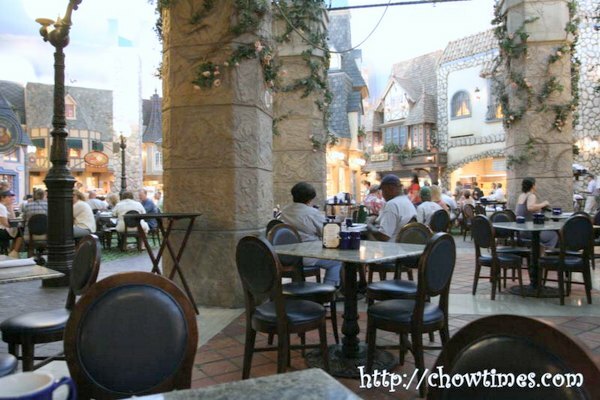 You get a choice of sitting “out” in the courtyard or in one of the “buildings” along the sides. We were shown the “outdoor” table — just what we wanted. Even though we learned that the buffet tables were organized by provincial cooking style in France, I did not even pay attention to it at all. I like that they came by with a flask of coffee just as we sat down even without us asking for it. Suanne and I need our coffee every morning. Oh, I expected to be greeted in French … well, at least a Bon Jour. The only frenchy thing about the waitress was her uniform. You know what disappointed me the most? They don’t serve baguette! I was so looking forward to trying good old French baguette here and was pretty sure they would have it — but no, none at all. I guess behind the facade, this is also very much an American breakfast. If you don’t have a car to get around, which we did not, the best way is to get a 24 hour Deuce Access Pass. 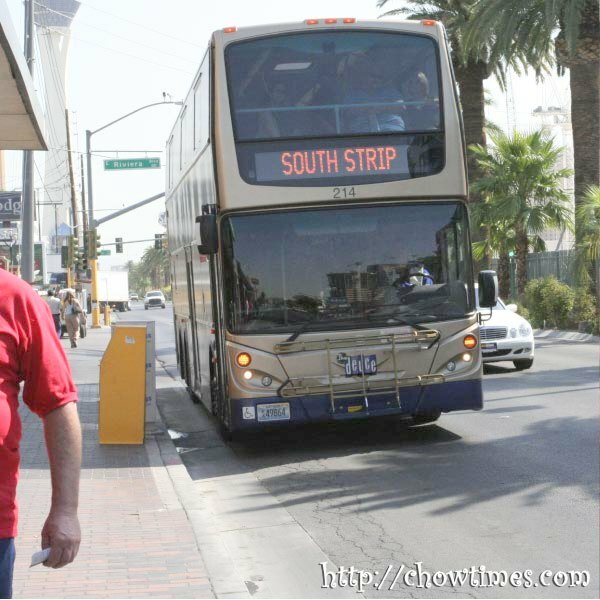 The Deuce is double-decker buses that ply up and down The Strip. They even go to other routes but we did not try taking those routes at all — doing that complicates my life. I like simplicity — the best bus routes just runs up and down a single simple route. 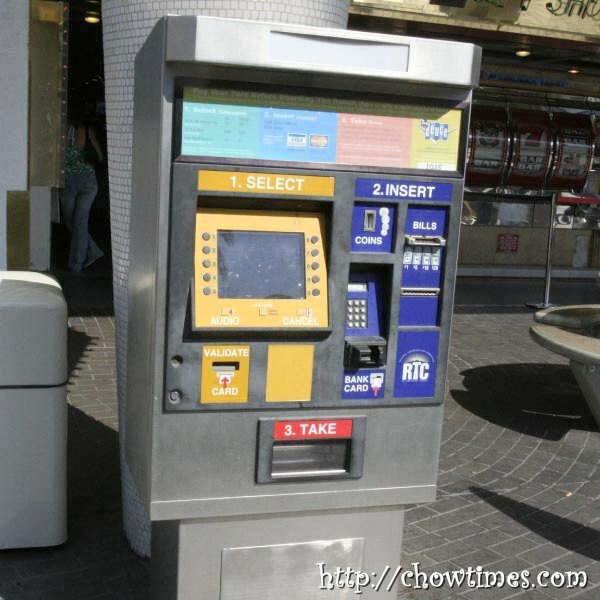 I think you can only buy the passes on these machines next to the bus stop. Mind you, we don’t see these machines in all bus stops. We just had one conveniently located right in front of the hotel. 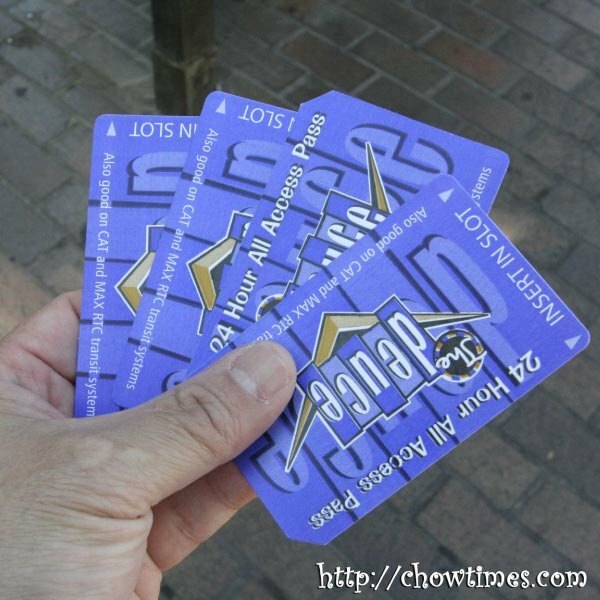 Like all-you-can-eat buffets, the Deuce 24 Hour All Access Pass is a all-you-can-ride pass. This is not just a day pass but is valid for 24 hours. Each 24 hour pass costs $5. If you want a single ride pass to anywhere along the route, it’s $2. If you feign disable, you get to pay only $1 — how’s that? If you don’t have a car, trust me, you want this. Really, this is unplanned for! Although we had planned for buffets in Las Vegas we had just wanted to get a small(er) meal for dinner. 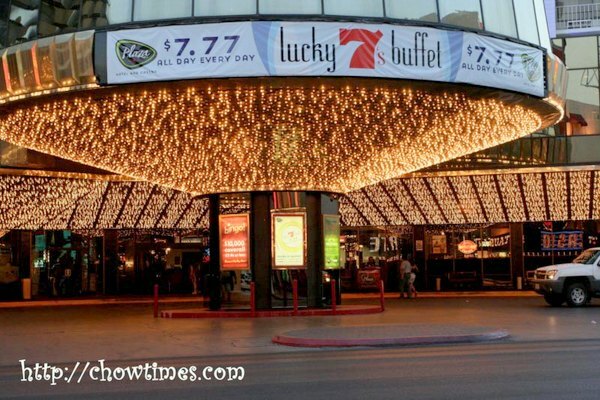 Well, walking down Fremont Street we can’t help but notice a sign that said $7.77 All Day Every Day Buffet. After spending almost $30 per head the previous two days, this is a bargain we can’t resist. No harm right? At the very least, we could just go in and check it out. This was at the Plaza Hotel Casino and the Buffet is called the Lucky 7’s Buffet. 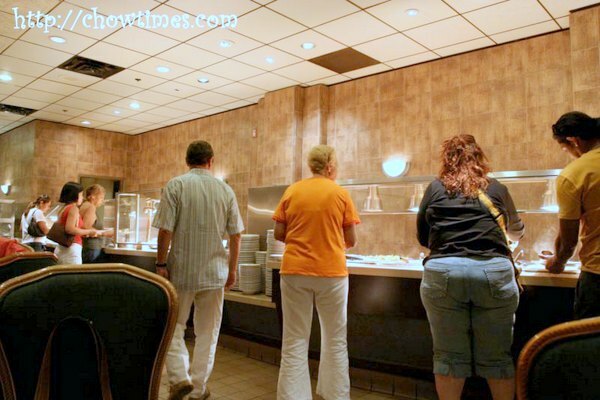 Bad move … first we see a long queue into the buffet which means one thing … that this is popular. And then checking what they served, oh boy, this is exactly what we like. Lots of meat and some comfort food. The boys love these no frills buffet … i.e. they enjoy sushi, burgers, fries, beef over crabs, seafood, and such. 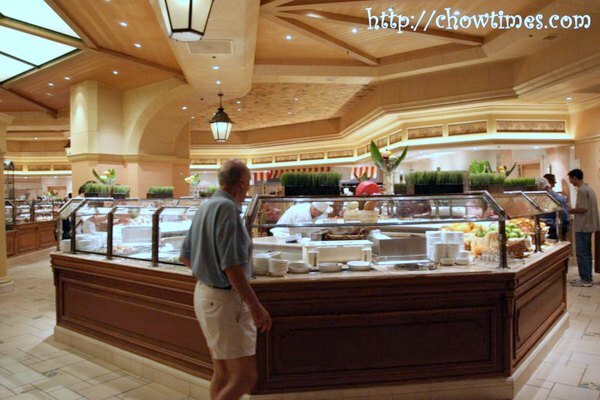 One cannot compare this buffet in any form with The Buffet at Bellagio — not in any stretch of imagination. It’s just a simple buffet … why, even the buffet we had at Ole Country Buffet is posh compared to this. 🙂 Still, they have more food choices than I would care to try everything. 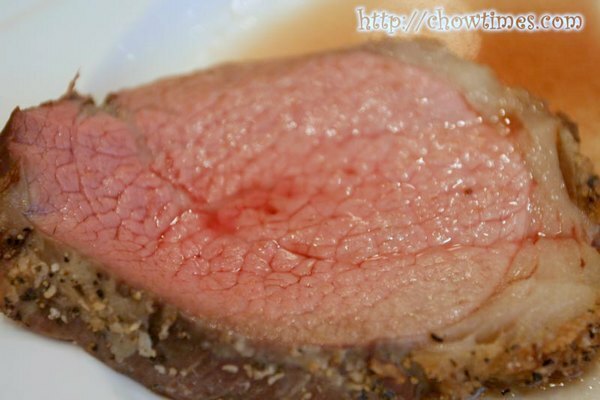 Arkensen and I loves meat … particularly roast prime beef … and only medium rare. This is really juicy and had the perfect amount of fat. We took a bus to Fremont Street one evening. 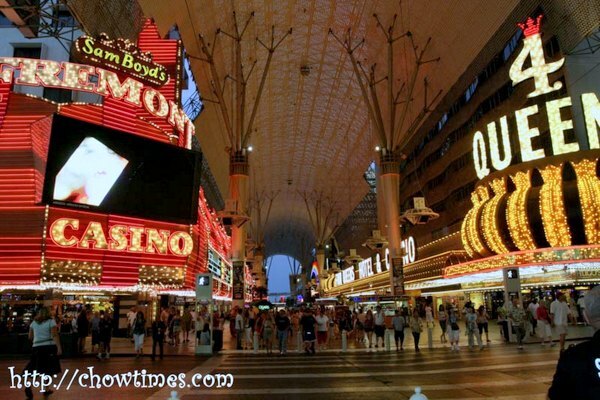 Fremont Street is located in downtown Las Vegas. Because of the glitter in The Strip, one can quite easily confuse The Strip as being downtown. Fremont Street is where the first casinos in Las Vegas ware opened — the place where it all began with the first gambling license issued in the 1930s. 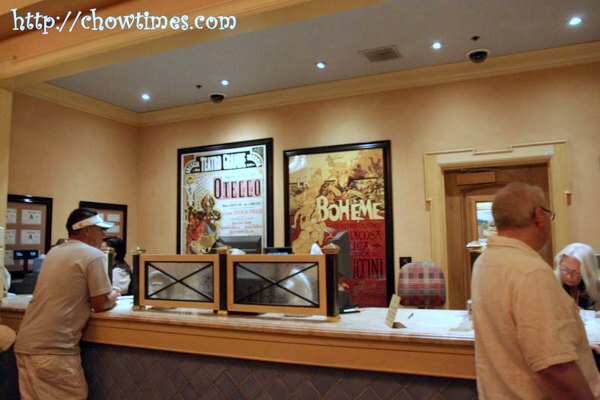 It is here that where the original and famous Las Vegas are located: Binion’s Horseshoe, Eldorado, Golden Gate, Golden Nugget and Pioneer Club. 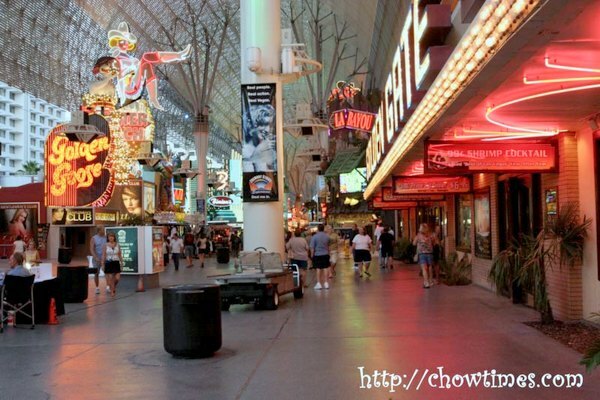 Fremont Street is now a pedestrian mall. 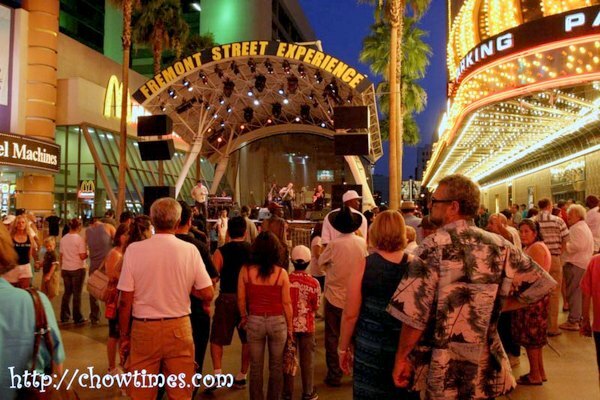 Back in 1994, the street was closed to install the now famous lighted canopy on Fremont in response to the intense competition from the glitzier hotels on The Strip. 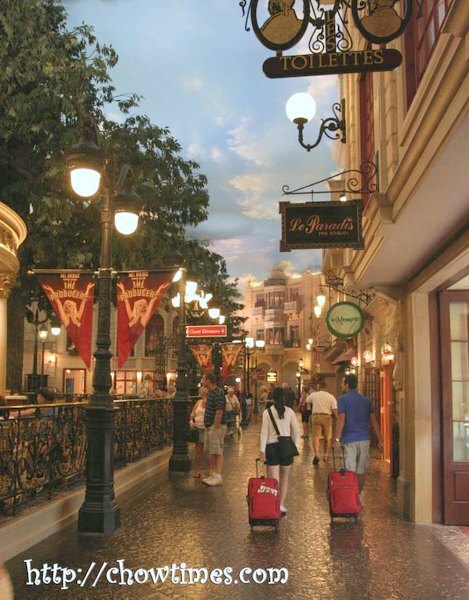 This makes Fremont Street definitely more comfortable walking with wide walkways and lots of things to see and do. We simply love being here … just standing there and absorb the sound and lights and people watching. Collectively this is known now as the Fremont Street Experience. We enjoyed the free concerts on permanent sound stages that they set up. 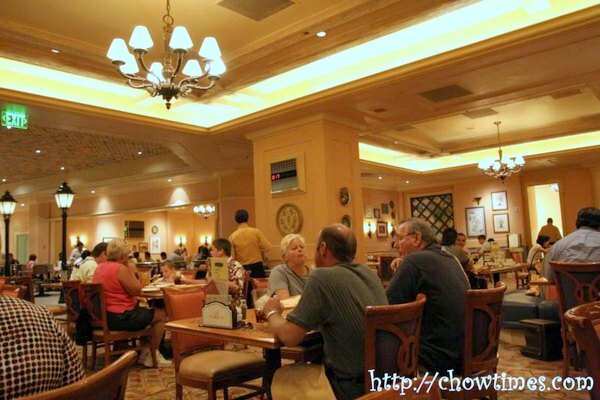 Las Vegas is not only about casinos … it is also known as the buffet capital of the world. There must be dozens of buffets all over the city in various types. There are buffets that costs under $10 and there are those that costs up to $40. We decided to try The Buffet at Bellagio because they claim to be the best (and one of the most expensive, if not the most expensive) in Las Vegas. Whatever it is, two words describes Bellagio best — High Elegance. 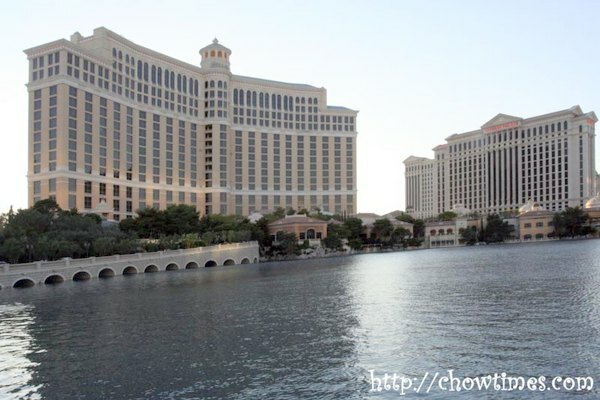 The Buffet at Bellagio serves American, Italian, Japanese, Chinese and Seafood cuisine. The attraction is their Alaska King Crabs and Kobe Beef. 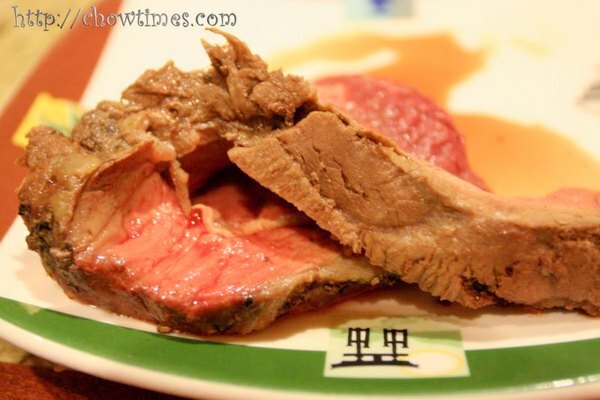 We had never tried Kobe Beef before but only found out that they only serve Kobe Beef on weekends. We were at The Buffet at about 5:00pm which we thought is early before the queue starts. We were wrong. Even at 5pm there was a line which stretches out to the entrance. The wait was supposed to be about 45 minutes from where we were. After waiting for about 20 minutes, someone gave us their Line Pass which allows us to get on the shorter line. We got in in just 3 minutes in the shorter line. We were pretty pleased with it. He he he … we felt pretty important too. There are no discount rates for children at The Buffet. All kids pay full price!! Obviously they deliberately do this to discourage families eating here. The buffet islands and counters were bright and clean. We had a first visual sweep of the entire area and had a tough time deciding where to start. For sure, there are no way we could try everything that is available as much as we try to get only bite size servings as much as we can. 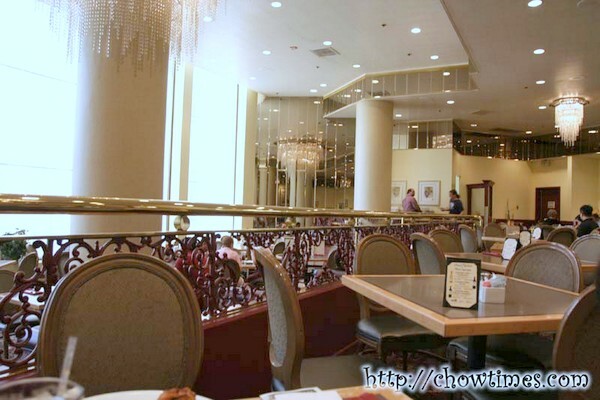 At the dining area, the seating, tables and lightings were comfortable, not plush. However, the table settings were good … no paper napkins, silverware and such. Oh well, we are here more for the food. Service was prompt and they kept our glasses filled and took our plates away as soon as we’re done. Oh boy, was it a scorcher! It was 45C when we landed. We knew how hot it will be as it was all over the news that Las Vegas almost hit 50C days prior to our arrival. When we stepped out of the air conditioned airport, it was still a shock. There was blustery wind but it made things worse because the wind made us felt like we’re in a furnace. We took a cab from the airport to the hotel. I wanted the cab driver to drive through The Strip but part of the street was shutdown because there was a fire at the top floor of the Venetian Hotel. So, he took the longer way through the highway. On the off ramp, the taxi was rear-ended by a SUV. I had a bit of a whiplash but the rest of the family was OK. The driver claimed he had a bump on his forehead but I think he’s trying to make a big fuss out of it. What a way to start a vacation! A new cab came by to take us to the hotel. The good thing is that the cab company decided not to charge us for the trip which came up to about $25. Now … what a way to start a vacation right? 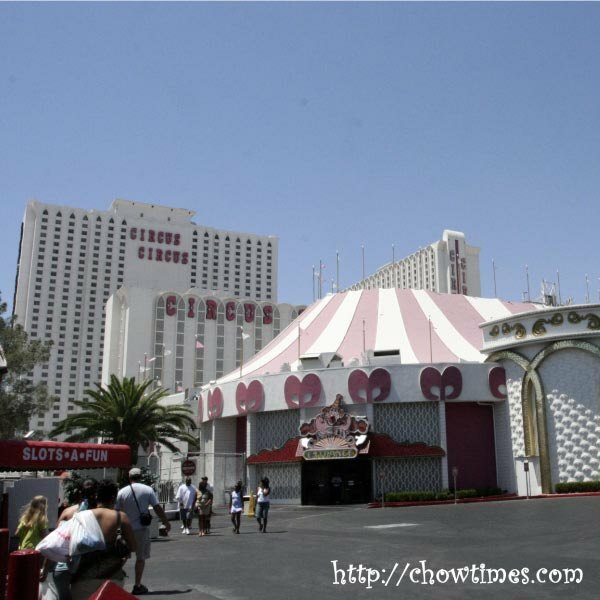 We stayed at the Circus Circus which is about one of the two kid friendly hotels in Las Vegas. The bad thing about this hotel is that it’s located almost at the northern most part of The Strip. This hotel is very old and is almost 40 years old. I think it’s only a matter of time before they implode this hotel and build a new one on this site. Compared to the newer hotels, this hotel does show its age. We chose this primarily it’s kid friendly and its now exorbitantly expensive (about $75 per day for a double queen room). Like most hotels in Las Vegas, this hotel is huge. It’s a long walk from the front entrance to the tower block. This hotel is used for the filming the James Bond’s Diamond Are Forever and Baby Geniuses. 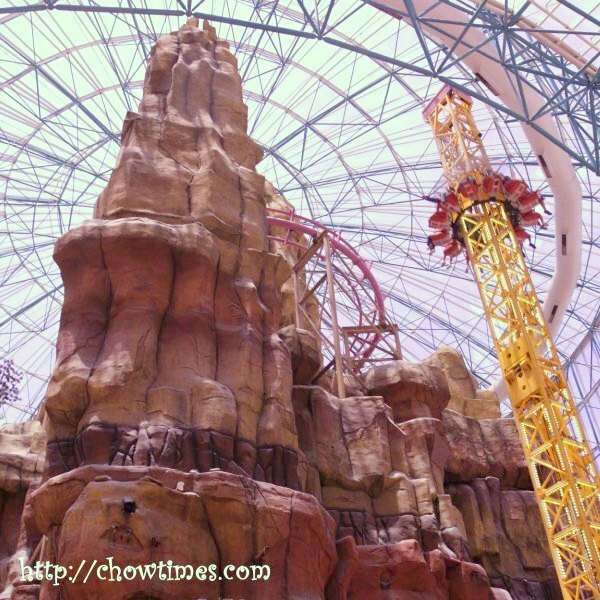 There is an indoor amusement park called Adventuredome in this hotel. We decided not to take on any rides here since we’ll be going to the Great America park the following week. There is a free circus performance about every hour or so. We managed to catch a 10 minute contortionist act at the Midway. There are very limited seating available. We had to reserve the seat 30 minutes before the show. After checking out the hotel, we decided to brave the heat and walk The Strip. I can’t believe how dry it was. I mean, just barely 3 minutes out of the hotel, I can feel the dryness — it was really bad for the skin and the nose. There were quite a few vendors selling bottled water for $1 each (which costs 30 cents if one get it from Safeway). 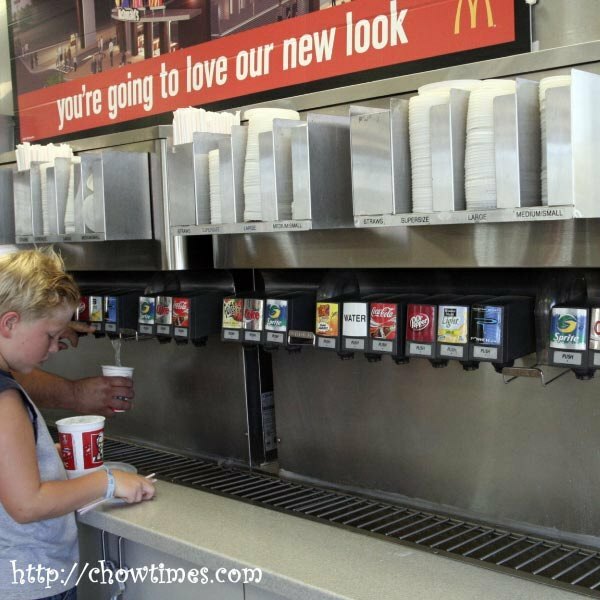 So, we decided to dive into McDonalds to get our drinks because they have all you can drink soda bar! We had originally planned for a road trip this summer to North California but decided to change our plans when we found cheap airfares out from Bellingham, WA to Las Vegas. I came across it quite accidentally when I heard over the radio of the news that a lot of Vancouverites had been coming over to Bellingham for cheap flights. 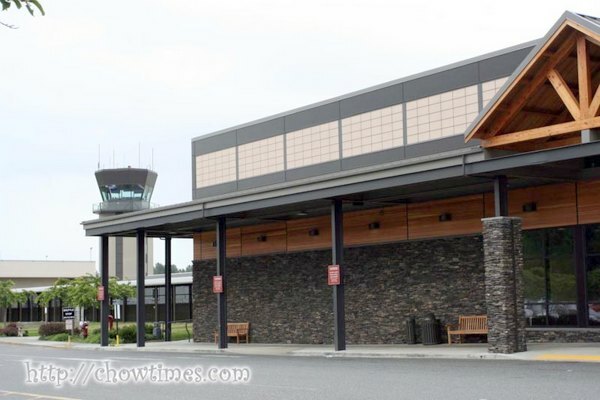 Although the airport is called the Bellingham International Airport, I don’t think they have scheduled flights to airports outside of the US. It’s a small airport really and that means that checking in and out is so much more faster and easy. 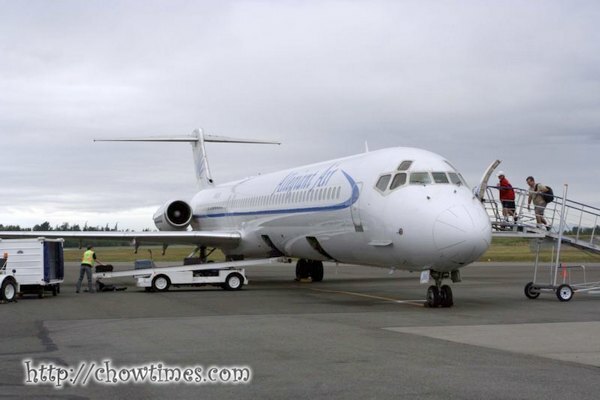 The flight tickets we bought were just $89 one way from Bellingham to Vegas. We decided to fly Bellingham-Vegas on our way there and take a return flight from Reno (which was just $39 or $59 depending on the day of travel), Taxes and all came up to about another 20% more. They do charge $3 for each baggage checked in. All in all, it’s a good deal — I figured it could be actually cheaper to fly than to drive from Vancouver to Las Vegas. You should check out their prices on their website … you’ll be surprised I’m sure. One thing though … you need to be careful about all the additional charges they put on. I am not surprised because this is a no frills fare they are selling. For instance, if you book the flight ticket over their website, they will charge you $7.50 convenience fee, It is not charged if you buy it from the ticketing counter at the airport. To select a seat of your choice, it will be an additional $11. If you want a choice seat, you have to check-in early … at least 2 hrs early. Everything about this flight is really basic. You don’t even board the planes via aerobridges but a walk-up stairs. Gosh … the only time I had boarded a plane via stairs were in Phnom Phen, Cambodia about 10 years ago!